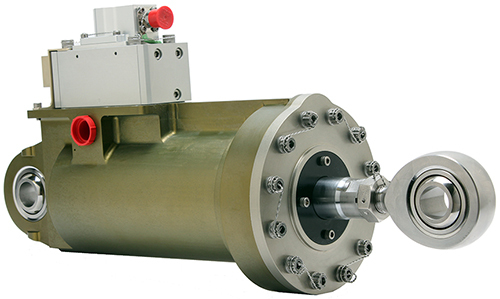 The JASC 101413 Hydraulic Servo-Actuator is currently the largest actuator in the JASC line. It was designed for flight surface control for a manned spacecraft launch vehicle and puts out 32,000 lbs of static force at 3000 psi supply pressure. This actuator exhibits excellent frequency response (4.4 Hz @ -3 dB) and incorporates an internal temperature-compensated LVDT for position monitoring.